EL CAJON — There’s a saying “be careful what you wish for because you might just get it.” Freddie Roach had always said that Bernabe “The Real Deal” Concepcion needed tougher opponents to prepare for a world title. Roach got more than he bargained for last Thursday night. At Manny Pacquiao’s first boxing promotional foray, MP Promotions, the 20-year-old Concepcion squeaked out a hard fought knockout victory against a tough chin, iron hearted Giovanni Caro of Mexico at the Sycuan Resort and Casino in San Diego. “The Real Deal” Concepcion faced a real test. Concepcion’s last two fights ended in knockouts lasting five total rounds and he barely broke a sweat in either of those two fights. This one lasted eight rounds but he left the ring with a left eye the size of a baseball and had blood seeping through the corner slit of the eye. Caro gave Concepcion fits all night long. Reminiscent of the Antonio Margarito vs. Miguel Cotto match up, Concepcion kept throwing his best shot at Caro but the strong willed Mexican kept coming. During the first round, Caro landed a series of jab and right cross combinations aimed at the left eye of Concepcion. In the second round, Concepcion landed a beautifully timed right cross to the chin of Caro, which immediately dropped him to the ground. This wasn’t enough to scare the Mexican fighter. And Concepcion did not try to finish him off. By the fifth round, Caro continued to pepper Concepcion’s left eye, which by then had swelled to the size of a mouse. It seemed that Concepcion threw the harder and cleaner punches at Caro throughout the night. However, the left eye now nearly shut bothered him creating a blind side that Caro quickly exposed. In between rounds, Roach’s corner was frantic trying to keep the swelling down as ringside doctors continued to monitor Concepcion’s eye. In the eighth round, the two fighters were tangled up in the corner. Concepcion threw what seemed like a clean right uppercut to Caro’s right mid section area. However, Caro bent down like it was a low blow and the referee deducted Concepcion a point. With time running out and the doctor nearly stopping the fight, the predominantly Filipino crowd rose to their feet. Concepcion knew he had to finish the fight soon. 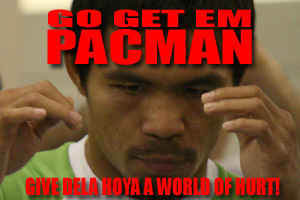 He looked over to Pacquiao’s ringside seat. Concepcion bumped his chest twice with his fist and nodded over to the pound-4-pound king. Once the referee began action, Concepcion pounced on Caro. Concepcion landed a series of right and left hooks cleanly to the head of Caro causing the latter to stagger towards the corner ropes. Concepcion continued to swing wildly and finished Caro off with another devastating right cross. Caro fell with his back towards the corner ropes. The referee counted him out. After the fight, Concepcion, who required eight stitches after the match, said that there was no way he was going to lose that fight. He said that Caro was one of the strongest and best fighters he’s ever faced. Roach said this fight would help Concepcion prepare for a world title shot. No one is doing Giovanni Caro any favors that’s for sure. In his last five fights the combined records of his opponent’s reads 80-12 and he has fought in his rivals backyard on four of those fights, yet he is 3-1-1 in those. So now Caro ,11-4-4,-(9), of Mexico City, is travelling to El Cajon, California to face the world ranked Bernabe Concepcion this Thursday, September 25 in the main event of a card promoted by Manny Pacquiao Promotions (MPP) in association with Sycuan Ringside Promotions at the Sycuan Casino. Manny Pacquiao manages the career of Concepcion,26-1-1-(15), who is ranked #3 by the WBO and #5 by the WBC and who, at 20 years old is considered by many the top candidate to take his boss’s place at the top Filipino boxer in the future. For Caro the challenge is a difficult one, but surely not impossible. On May 2 of this year he travelled to Mexico to face Ricardo “Piolo” Castillo for the Mexican Super Bantamweight title and walked away with the title with a 11th round TKO in front of a stunned hometown crowd that included Castillo’s, older brother the two-time world champion Jose Luis Castillo. In his last fight he was on the canvas in the third round and got up to beat Gabriel Perez in the fourth round to retain his Mexican 122-pound belt. So you know tt’s going to take a lot to intimidate Caro, who is coming for a win no matter what it takes. SAN DIEGO, Calif. – Manny Pacquiao’s next big test inside the ring will be against Oscar De La Hoya, but before he takes on boxing’s most popular figure, the four-division champion faces the challenge of co-promoting his first boxing show with Sycuan Ringside Promotions on Thursday, Sept. 25, 2008 at Sycuan Resort and Casino in San Diego, Calif. The memorable night of boxing features Mexican boxers against Filipinos with the main event pitting Bernabe Concepcion against Giovanni Caro in a ten-round super bantamweight bout that begins at 7:30 p.m. PT, televised by Azteca America. Concepcion, who is promoted by Pacquiao, is 26-1 with 15 knockouts while Caro is the Mexican 122-pound champion with a record of 11-4-4 with 9 knockouts. The handlers of North American Boxing Federation super bantamweight champion Bernabe Concepcion (26-1-1, 15 KO’s) are matching him against Mexico’s tough Giovanni “Ruso” Caro to find out whether the hard-hitting 20 year old Filipino is ready for a possible title shot at WBO featherweight champion Steven Luevano in the near future. Michael Koncz who together with Filipino boxing icon Manny Pacquiao and Aljoe Jaro handles Concepcion said he will headline an exciting fight card promoted by MP Promotions (USA) in which two other Filipinos will also see action. The fight card at the Sycuan Casino in El Cajon, just outside San Diego will see super featherweight Aaron Melgerejo, a one-time sparring partner of Pacquiao take on Alain Fernandez while lightweight Dennis Laurente clashes with Arturo Urbano. In a female bout undefeated Chika Nakamura (6-0, 2 KO’s) will take on Tammy Franks. A couple of other slam-bang four rounders will spice up the card which Pacquiao said he was very happy about. Celebrated trainer Freddie Roach said he wanted an opponent for Concepcion who was “durable and somebody who will give us some rounds.“ Apparently Caro is the man. He forced Gabriel Perez to retire some ten seconds into the 8th round last July 30 and before that scored an 11th TKO over rugged Ricardo Castillo who boasted of a 33-5 record with 22 knockouts on May 2. Earlier, Caro scored a 9th round TKO over Oscar Ibarra who had a record of 13-1, 6 KO’s proving that Concepcion’s opponent is no pushover.